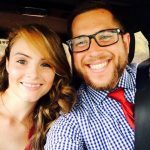 What’s happening craft beer lovers of RVA?! Welcome to this week’s “Tapped,” RVA Magazine’s go to weekly craft beer column where youday can find all your craft beer-related events, releases, festivals and all the booze news your little hearts’ desire. 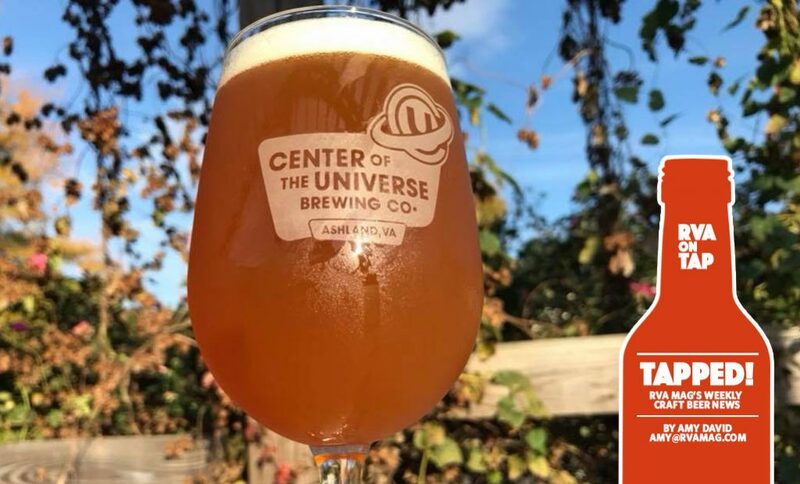 Center of the Universe Brewing will celebrate their Five Year Anniversary this entire weekend starting Fri., Nov. 17. During the three-day bash, the Ashland brewery will celebrate by bringing back some old favorites as well as showcase new experiments straight from Origin Beer Lab, its sister brewery. On Fri., COTU will have the return of The Richard, an imperial IPA hopped up to the max. The Tender Band will also be returning to the COTU stage on Friday. Saturday, the party continues, and COTU is tapping some old favorites as well as new beers that have graduated from Origin Beer Lab. Here’s the line-up: Oaky Pokey – an old favorite made with their flagship IPA, Pocahoptas, Black Dawn – a one-off seasonal black IPA from 2016, Bee Generous Honey Ale (new) – a graduate of Origin Beer Lab that was developed by Ashley Ray. Just Plum Sour (new)- a kettle soured Belgian Dark Strong that has been aged on plum puree. There will also be a vintage bottle sale starting on Saturday. COTU will be releasing 750ml bombers that have been stored away. See Facebook details for specific bottles. Day 3 is a full-on celebration of the COTU Satellites, Center of the Universe Brewing’s biggest supporters. The Satellites are a group of like-minded beer enthusiasts who use Center of the Universe Brewing as their hub. Here’s the lineup: Tedd’s American Rye Ale, Nathan’s Guava IPA, Bridgette’s Crazy Bet Imperial Red (Bridgette chose to bring back an old seasonal from 2013), and Rob’s Verbunden Dunkelheit. COTU will also have your bingo and bloodies for you on Sunday so be sure not to miss out on this big party! Strangeways has two big releases for us this weekend. First up, its Tirami’zu Brew Rum Barrel Aged Porter, a collaboration with the owners of Richmond’s Italian staple Mamu Zu and edo’s squid on Saturday. This porter underwent months of rum barrel aging with cocoa nibs, vanilla beans, and coffee from local roaster Black Hand. The brewery will also release its Home for The Holidays Spiced Cranberry Sour on Saturday as well. The brew is a cranberry tart sour, brewed with pilsner and wheat malts then conditioned on 260 pounds of cranberry puree. On Saturday, Steam Bell Beer Works will release its Tirmasu Stout with Coconut in bottles. limited run of Tiramisu Stout with Coconut bottles on November 18th at noon. This 9% Imperial Milk Stout is rum conditioned and aged on whole vanilla beans, local Ironclad Coffee Roasters beans, and toasted coconut. On Friday, Isley is getting into the holiday spirit with the release of their Rudolph the Rednose Reinbeer. The brew is a cranberry, cinnamon-infused Red Ale! Hardywood will release its beloved and coveted Rum Barrel-Aged Gingerbread Stout on Saturday. raft + 750mL bottles. No growler fills. Limit 8 bottles per guest per transaction. Price: $13.99+tax/bottle. On Sunday, Hardywood will a Fall Harvest Festival from Noon-5pm. This event is FREE to attend and open to all ages! Rain or Shine (will be moved indoors based on weather). Here’s the rundown: KID-FRIENDLY GAMES + ACTIVITIES: -FREE Pumpkin painting Paint Nite Richmond Face painting for a small fee hosted by Paint Nite Richmond, Corn kernal sandbox hosted by Richmond Waldorf School. Food Trucks, live music and of course, beer. Hardywood will be tapping a new ESB brewed at the Charlottesville Pilot Brewery! ‘E.S.B. White’ is an Extra Special Bitter perfect for this weather. The Return of Aragonia, an English Brown Ale with espresso comes back to Twisted Ales this Saturday. The espresso comes from Rostov’s and the brew features caramel and chocolate notes so it’s perfect for a chilly fall night at the brewery. It’s a dual stout release weekend at Three Notch’d RVA Collab House this Friday and Saturday. First up, is “M.A.S.H. Up”, a Blackberry Stout made with the folks over at M.A.S.H. (Mentoring Advanced Standard of Homebrewing) club. Pint Specials on the Blackberry Stout from 4-7pm. Then on Saturday, its “New Lions”, a Blonde Stout which is a collab with local band Clair Morgan and a tribute to their album New Lions and the Not-Good Night. which supports high school and college students in Richmond, Virginia who are experiencing homelessness and housing instability. Raffle for Veil 4-packs and swag. $5 cash tickets. All proceeds go to Change the World RVA. 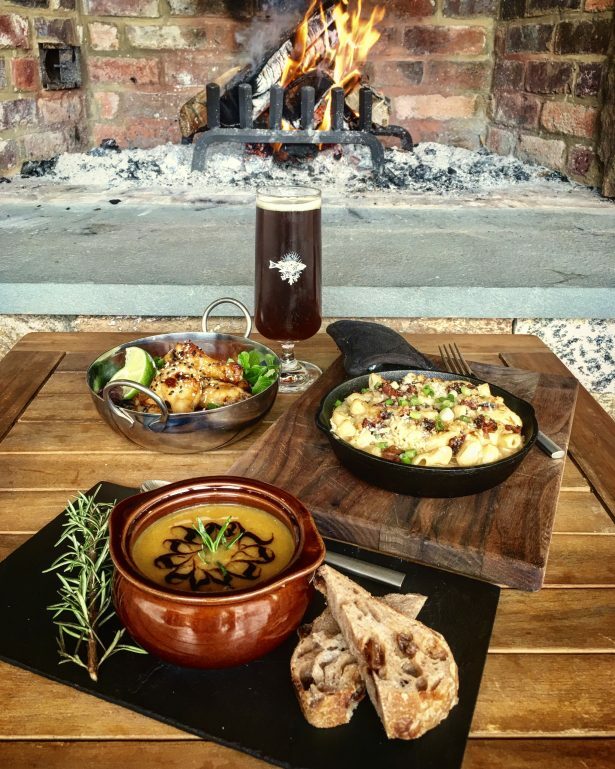 On Thursday, Ardent Craft Ales will host its annual Friendsgiving, which will feature dishes from some of your favorite chefs and restaurants around Richmond. To reserve your seat, just donate 15 cans of food in the taproom starting right now up until the event. The food you donate will go directly to FeedMore to support their work feeding children, families, and seniors across Central Virginia through programs like Meals on Wheels, the Central Virginia Food Bank, the Mobile Pantry, and Kids Café. If you can’t donate, the cost is $15 to get in. But seriously, donate. Fine Creek Brewing in Powhatan will have Cook County Bluegrass this Saturday 3:30-6:30. They will be doing Brunch again this Sunday, and have their Powhatan Mimosa, a light Belgian table beer with OJ added in the brewing process. Legend Brewing’s seasonal Ember Ale has hit shelves this week so make sure you grab some of that to ease you into the holiday season. This Friday, Vasen Brewing in Scott’s Addition will release Hardtail Ale, brewed in collaboration with Richmond Cycling Corps, and The Martin Agency. The brewery and businesses have made a Belgian style saison. Your $25 ticket also includes custom schwag designed by the Martin Agency, Free bike tune-ups thanks to Richmond Bicycle Studio, Indoor bike race on GoldSprints (cult classic)!, One ticket for raffle of a Masi Speciale Uno track bike ($800 bike up for grabs) and one glass of beer. 100 percent of the ticket cost will be donated to RCC. We are in the midst of Cider Week Virginia, and from now until the 19th, you can find all cider-related events here. Let’s highlight a few. Buskey Cider will release its Cranberry Basil Cider this Saturday. Any submissions or ideas for Tapped can be emailed to Amy at [email protected] Cheers! Top Photo Credit: Center of the Universe Brewing Co.